Perilla frutescens var. crispa, shiso, in Crawford, GA. Notice the ruffled edges. Perilla frutescens, a relatively new green-leafy vegetable introduced to North America from Asia and naturalizing throughout the eastern US, is popular in Asian dishes and a source of expensive omega-3 essential fatty acid supplements. Growing in the Athens area are two variants: one is called shiso (Perilla frutescens var. crispa), which is either green or purplish-burgundy with ruffled, deeply serrated edges, and the other is egoma (Perilla frutescens var. frutescens), which has flat, green leaves with serrated edges. When identifying either variety of Perilla, a distinguishing characteristic is in the anise-basil smell of the foliage when it’s crushed. Since Perilla’s in the mint family (Lamiaceae), it will have a square stem. Flowers rise up on four-sided stalks, resembling basil, but are taller and more pronounced. I usually find Perilla in a moist, semi-shade habitat, such as the Fred Birchmore Nature Trail in Athens. Listing the health-promoting properties of Perilla would appear to place it in a panacea, cure-all category of potential world crops. Evidenced-based research matches the claims, which might make this a top-ten plant in usefulness. 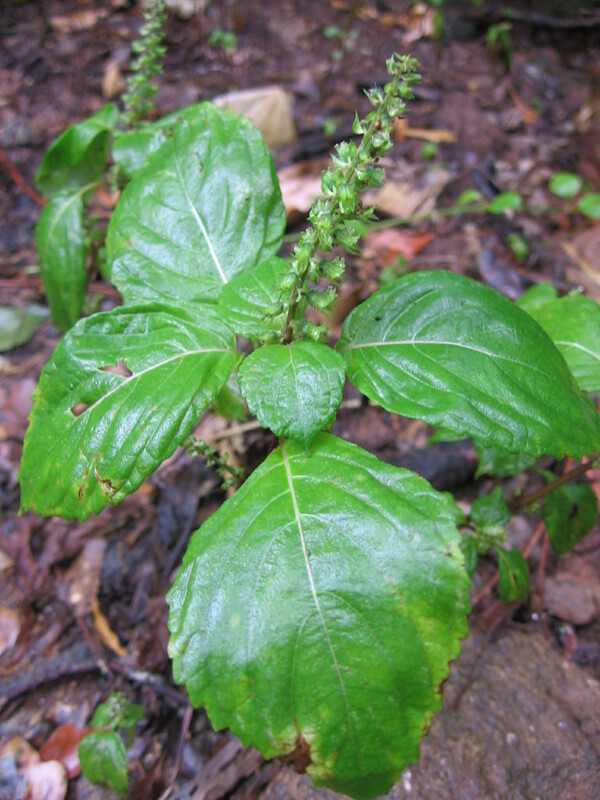 Perilla frutescens var. frutescens, egoma, on the Fred Birchmore Trail in Athens. Perilla’s antimutagenic, antioxidant and anti-inflammatory qualities lend it to be a traditional herb for treating cancerous tumors in Asia. Research studies of Perilla leaf extract have found the herb efficacious in treating human leukemia and human hepatoma cells by increasing apoptosis-related genes and apoptosis (programmed cell death) in the cancer cells. In one study on liver cancer, scientists compared the Perilla leaf extract to rosmarinic acid, a potent antioxidant compound found in high quantities in Perilla, to determine whether the activity is attributed to the rosmarinic acid. The study found the whole-leaf extract of Perilla was significantly more effective than the isolated constituent—a possible argument for wholeness. 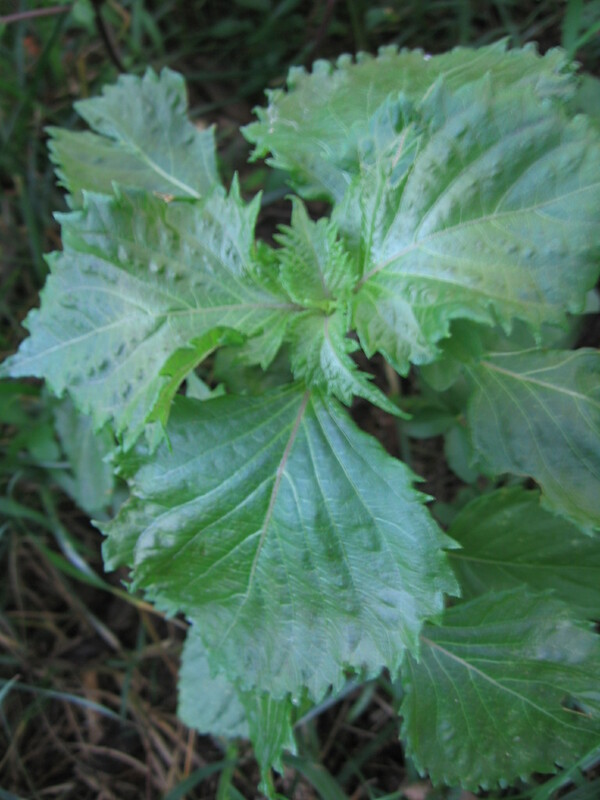 Scientific studies have also verified the efficacy of using Perilla as an antidepressant. The studies were based on a Japanese herbal remedy which uses Perilla for its effect on depression associated with chronic unpredictable stress. There’s a lot of that going around. Oil extracted from the seeds is high in omega-3 essential fatty acids, and can be an alternative to fish oil. Perilla oil has a neuroprotective and cardiovascular-protective effect, and is a possible preventative for strokes, Parkinson’s disease and Alzheimer’s disease. There’s no need to make an alcohol tincture or water extract of Perilla because it’s an excellent, flavorful, cooked veggie, which has up to five times the carotene found in carotene-rich vegetables. Nutrition studies compared Perilla to spinach and found Perilla to be significantly higher in lutein than spinach. In addition to the carotenes, Perilla has an abundant supply of antioxidants, such as rosmarinic acid, flavonoids, and anthocyanins. The omega-3-rich seeds of the flat-leaf Perilla can be used as a topping for salads or a spice. In Japanese cooking, the leaves of the ruffled-leaf Perilla are dredged in tempura batter and fried. The purple leaf variety is added to vinegars, pickled foods and rice to give flavor, a pinkish hue, and antimicrobial properties. There’s no telling who is responsible for introducing Perilla to the US, but since it’s here, I’ll learn how to put it to good use.